I’m participating in the LetsBeWild.com Wild Weekly Photo Challenge! This week’s challenge is: Fall. Wish me luck! 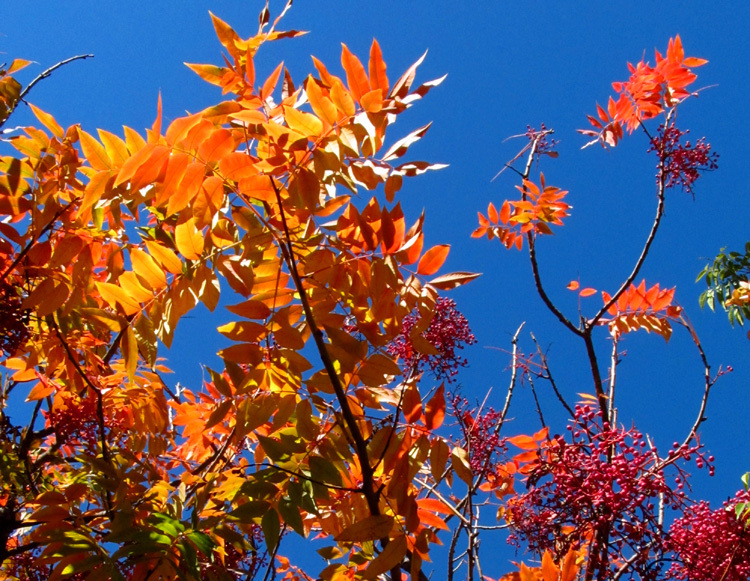 There isn’t a lot of fall foliage in San Diego but sumac trees are a treat to spot. 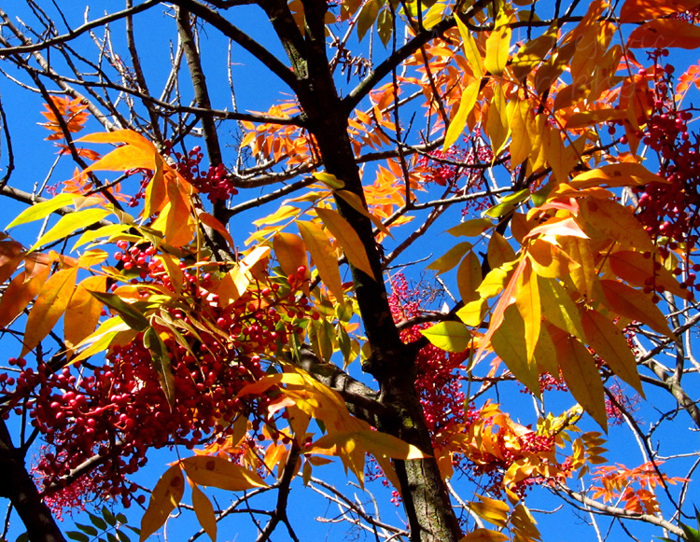 Their leaves display various shades of yellow, orange and red and the tree also features grapes of crimson red seeds in between the leaves. Click on any photo below to see a larger image. Posted by Milka Pejovic on October 11, 2012 in California Photos, Photography, Photos of San Diego, Tree Photos and tagged California pictures, fall foliage photos, photo of sumac, photography, photos, photos of fall foliage, photos of trees, sumac leaves, sumac photos, sumac tree, trees, weekly photo challenge. Such a great contrast with that blue sky. Thanks! I saw blue sky like that yesterday and I thought about you. You could look one way and see bright deep blue sky and turn around and see washed out blue almost grey sky. It all depends which way you look at it! Thank you for the compliment, and thanks for checking it out! Brilliant colours! Wonderfully blue skye too. I wish more days like that! Thank you for stopping by! I’m glad you enjoyed my photos. I’m lucky enough to enjoy blue skies most days of the year, here in San Diego. the images are beautiful and very appropriate! Thanks for stopping by! I think you’ll have to expand your horizons or find a photo from “your” fall season. Living in San Diego makes it a challenge to find colorful foliage, so you have to really look around to find something like sumac. It has to be the most colorful tree in town. Good luck! I’ll have to stop by and check it out when you’ve published it.